Certain things stick in my head for much longer than even I expect. I sometimes get online and search for whatever just came to mind, and sometimes they turn out to be so long ago that most of the results come from websites that nobody has ever heard of. Regardless, in the course of doing so, I found that one of the modes in Magic’s new Arena video game is Standard Singleton. 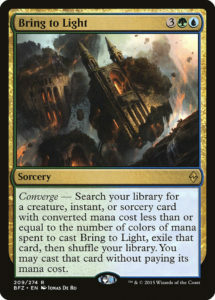 This this was a popular Magic Online format around the time of Zendikar‘s release, and it sort of faded from attention. Perhaps players decided that one is not the loneliest number after all. I’m biased – I love singleton formats. I’ve talked about this fact in the Card of the Day reviews many times; something about the Rule of One just makes a lot of sense to me. Even when a card isn’t legendary, it often seems to depict a unique person, place, or event, and even with the possible justifications about summoning a memory or a copy or what have you, I like looking at the table in front of me and seeing variety and uniqueness. 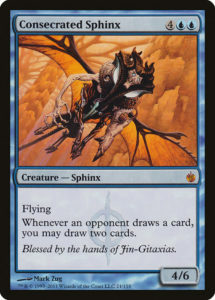 Besides, for the more budget-minded among us, one is about the number of any given card you would expect to own! Standard Singleton also reminds me of an obscure format for which I have long carried a torch: Inkwell Looter’s Filth Casserole. 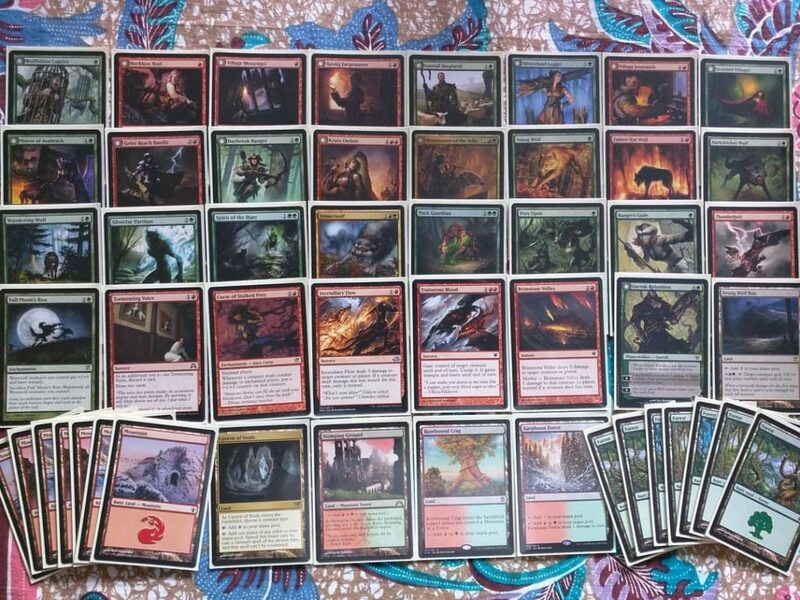 He introduced it in 2011, and it got a little bit of fanfare and even a few trials and publicized decklists on Magic-League.com, but never caught on in the way that Commander or Modern (originally Overextended) did. Perhaps as a singleton duel format, it occupied a difficult space – it’s susceptible both to the question of what it offers over 1v1 Commander and the question of what it offers over duel formats like Modern. 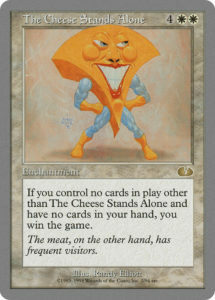 Should one reveal a new format with decks headlined by some of the most hated cards in EDH? Seriously, I really don’t know. Additionally, 50 cards is an unusual number: other than Tiny Leaders, I’m not aware of any constructed formats whose decks go so small. I can’t speak for Inkwell Looter’s intention with any certainty and I haven’t asked him, but I suspect that I’ve played more Filth Casserole than anyone currently writing about Magic; at the risk of sounding conceited, I may even have played more of it than Inkwell Looter has. The decks are somewhat more consistent than decks for other singleton formats, even before you add consistency-generating cards like Sleight of Hand. But I suspect this was actually intended to be a feature, not a bug: Commander’s 99-card decks play into its spirit involving longer games with multiple players, while Filth Casserole was always envisioned as a faster one-on-one setting. The slightly smaller decks size means that even a deck that didn’t instinctively reach for all the tutors and all the redundancy is similarly slightly less random than it would be in, say, Brawl; but it does make card-drawing analogues more powerful when a sixth-turn Opportunity is drawing almost 11% of your deck rather than 8.5%. Highlander formats can be hard to balance. That’s why the Canadian and Australian versions assign points to problematic cards and limit the number of points a deck can have. I’m not a fan of that approach. It doesn’t even entirely address the issue, as a game where one player draws all their Moxes or other points and the other doesn’t brings you right back to the beginning and the ostensible reason for a points list. Australian Highlander is also (in my experience) prone to over-competitiveness, as its gatherings tend to be tournaments with rare old cards as prizes, and people get overzealous. Highlander formats are well suited for casual play and poorly suited for competitive play; if you make a situation where it actually matters who wins, it’s a lot more likely that people will start making excessively redundant decks and otherwise abusing the format. Seriously. If you believe that Time Spiral-Lorwyn-Shadowmoor Standard was the best season, you can still play it. 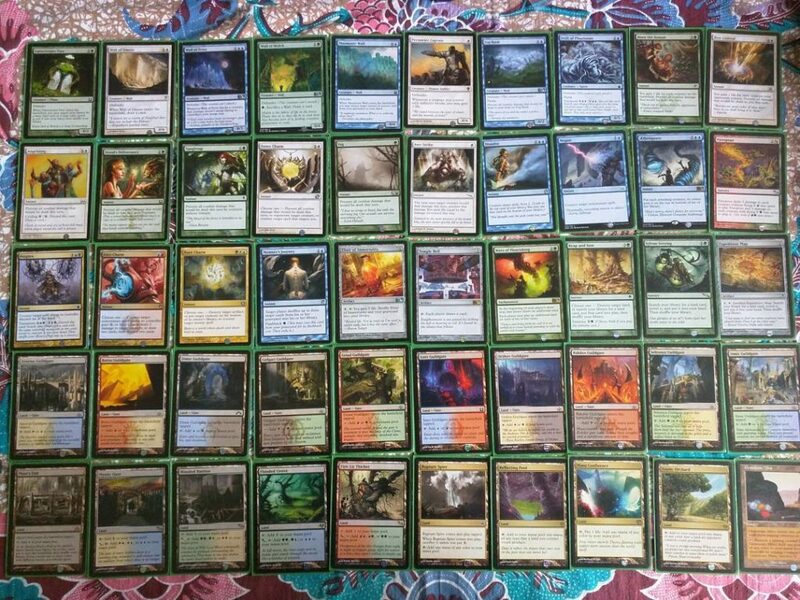 If you think that Alara was actually the best multicolor block and it goes well with everything, you can prove it. 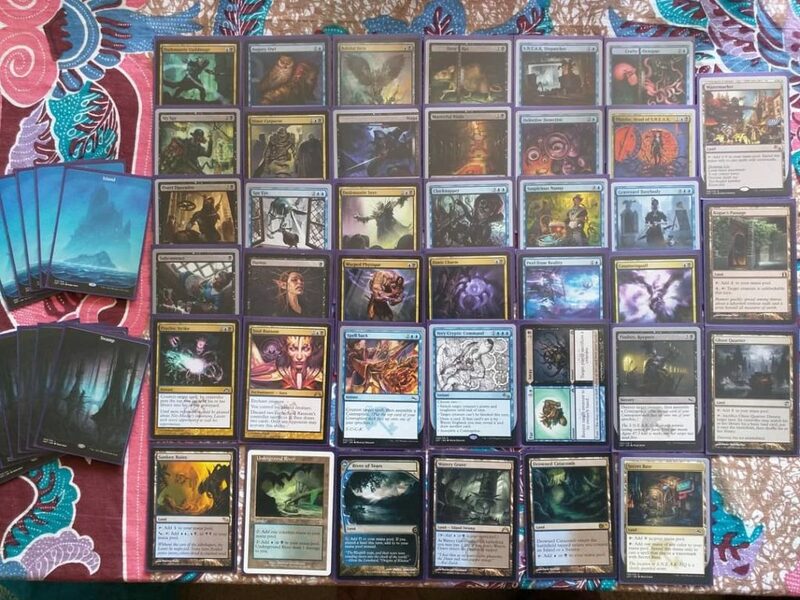 If you know that there are decks hiding in Battle for Zendikar that were overshadowed by the Eldrazi, you can bring them to light. Not just a play on that last paragraph – try it with cascade! If you want to play Filth Casserole or Prismatic Stairwell or your own Highlander format as a Choose Your Own Standard variant, go for it. 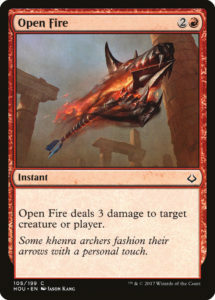 If you want to start at Lorwyn and call it something like Age of Planeswalkers, that might be at least as good a measure of Magic’s modern age as the Eighth Edition’s card face. If you want to make it a format about the Gatewatch, you can start with Magic Origins. If you find fetchlands and shocklands together to be too overpowering, ban one of those cycles. 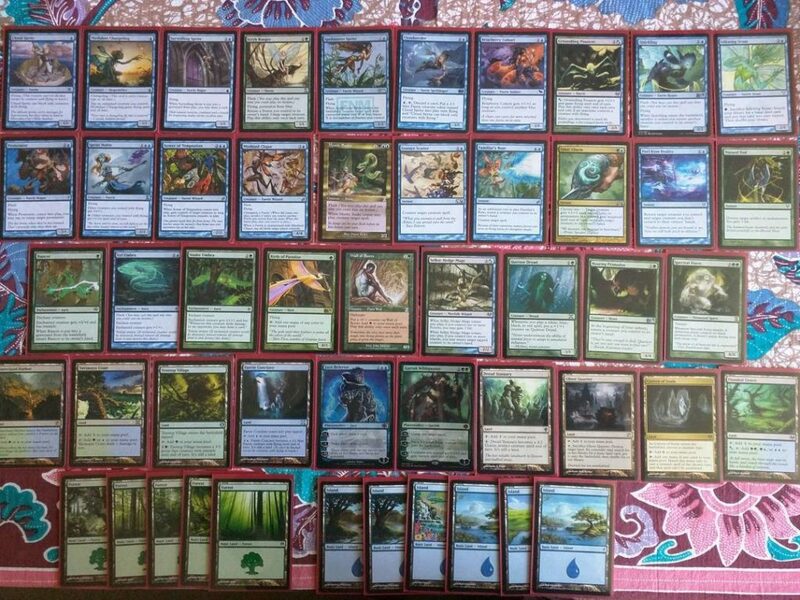 If you remember the 90s and want to forget the 2000s, go the other way and make it Premodern. Heck, the blogger Triceratopping even hybridized Filth Casserole with Commander itself. I can tell you this all I want, but the internet is in many ways a visual medium and we like to be shown. So I’ll borrow a practice from the Swedish 93/94 Old School community, and leave you with a couple of photographs of Filth Casserole decks. These are from my Instagram account, where I occasionally post random pictures of my cards, decks, books, Lego, and other stuff. Whatever decks and cards you end up playing, just make sure they’re ones you enjoy, even if that’s just for what they look like when they’re laid out in collage format. The friendlier version of Faeries? You can play Filth Casserole with silver-bordered cards, too! Note that if you do, all your decks will probably need an answer to Contraptions. Previous articleWickedly Cool Pokémon Swag Emerges from the Shadows!